It’s been a tough couple of years for my kids, and our family. We’ve lived in three states and moved cross country twice over that short period of time, and that’s meant a lot of changes, including leaving the only place they’ve ever really known. We are starting to get settled here in upstate New York, and in the process of building a home, where we hope to live for a very long time. 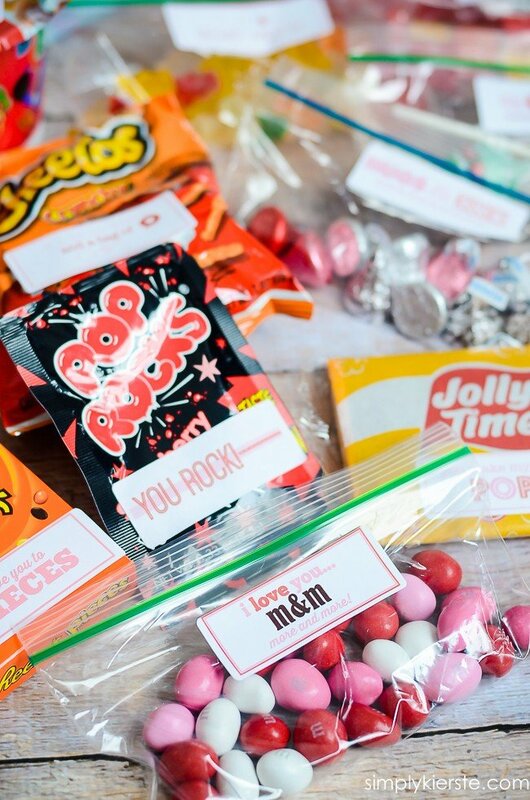 I’ve felt like doing some extra-special things for my kids and my husband, to show them how much I love them, and give them a little extra joy, and Valentine’s Day is the perfect time to do that. 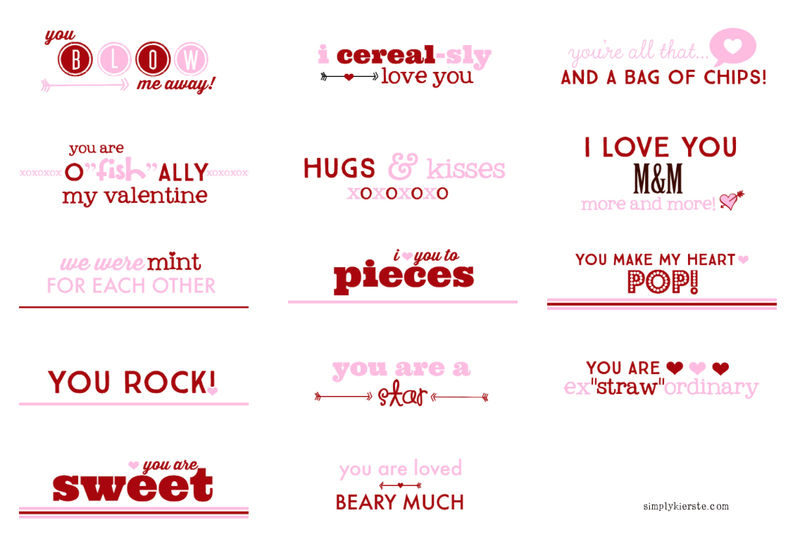 I created a really fun 14 Days of Valentines, and I know they are all going to love it! I gathered cute Valentine candy, and some other treats and snacks I know they love, then made “cheesy” Valentine printables to along with them…14 in all! Starting February 1st, they’ll have something fun when they wake up, all the way until Valentine’s Day! To make things MUCH easier for myself, I actually made the printables to be labels, so all I had to do was peel and stick. I have six kids and a husband, so over 14 days, that’s 98 valentines! Yep, it definitely needed to be labels. Some of the items I bought were in individual boxes or pieces (like the Reese Pieces, Pop Rocks, Conversation Hearts), because it actually ended up being less expensive that way. Most of them I bought in bags or in bulk, and then divided them up. 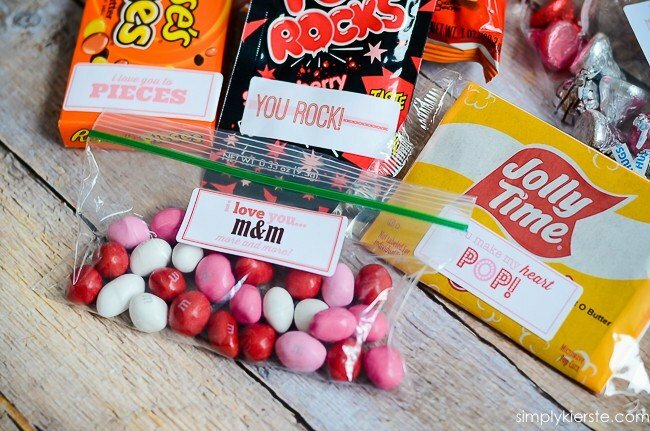 I used snack bags to portion them out, added the printable label, then placed all the snack bags for that item in a large gallon bag. In the end I had 13 large gallon bags, and one larger bag for the cereal. This way I can just grab one each night, and they’re totally ready to go. The gallon bags can right back in my pantry, since they’ll still be clean! I’m going to put them on their kitchen stools each night, so they’ll be sure to find them at breakfast. You can give them in the morning, put them in their lunches, in your husbands car, or even have them after dinner–whatever works the best for you! 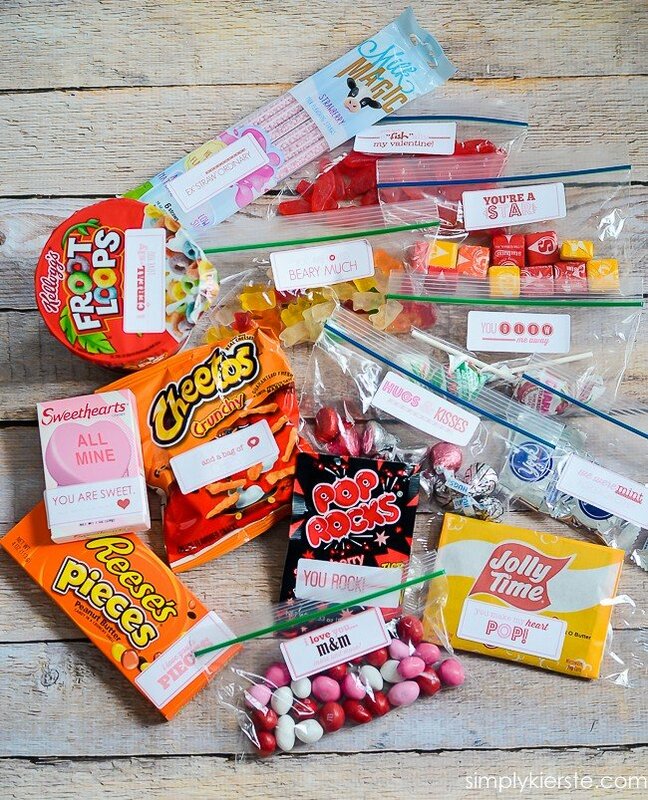 These can also be used individually as Valentines, and I think we might be doing the mini popcorn bags. You could fancy them up a little by tying bakers twine around the popcorn bag, and placing the label right on top of it to keep it in place. 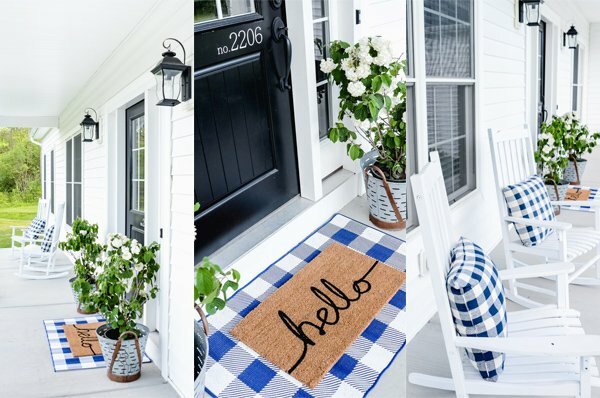 Super cute, and super easy…love that! If you’d like to print the labels, click on the link below. They’re designed for Avery Address Labels (8160) . If you want to make tags instead, just print it onto white card stock, cut them out, punch a hole in the corner, and tie on! PRINTING TIP: Make sure your printer settings are set to “actual size” and not to “fit”. They should print correctly. 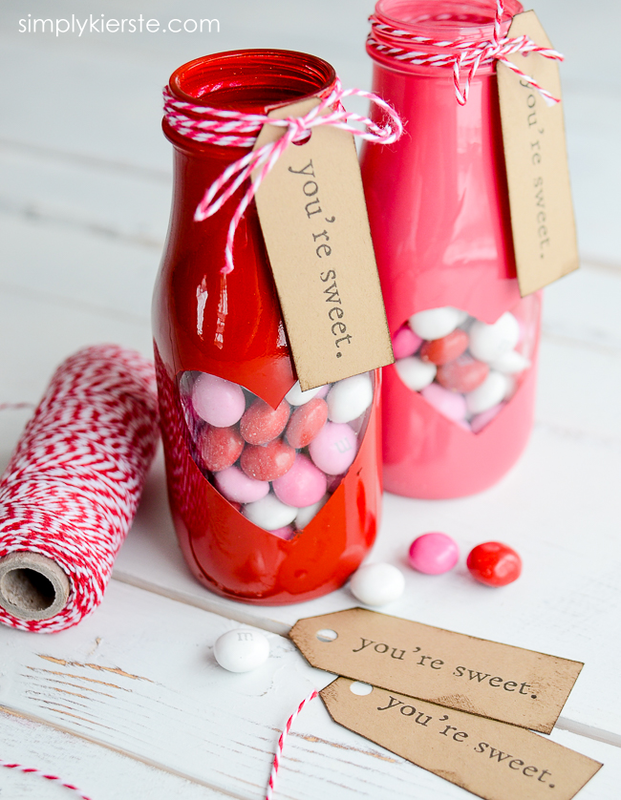 You might also enjoy these darling Peek-a-boo Valentine Jars…super easy and awesome gifts! These are great! I did 14 days of Valentine’s a coupe of years ago. The kids loved them and I had fun creating them. Thank you for these. Can you tell me where you found the flavored milk straws? Sure! I bought them at my local grocery store, in the aisle where the Nestle Quik is! Thank you! I’m excited to do this for my little family. I have a question. I tried to print the labels and it didn’t fit just right. Do I need to do anything particular to get this to print right? Something with the margins maybe? I’m not sure what I am doing wrong. Thanks! If that’s not it, let me know! I think they would love this! My kids are always happy about candy. :) And if you love it, that totally counts for a lot!! ive been doing the 14 days of Valentine’s for my family for three years now. We all love it so much! My oldest just realized that not every mom does this and decided she wanted to do this for her kids when she grows up. I’m glad to find someone else who does this, too! Family traditions like these help our children feel close to us and each other, and are so important. Love your labels! I just might use those next year! 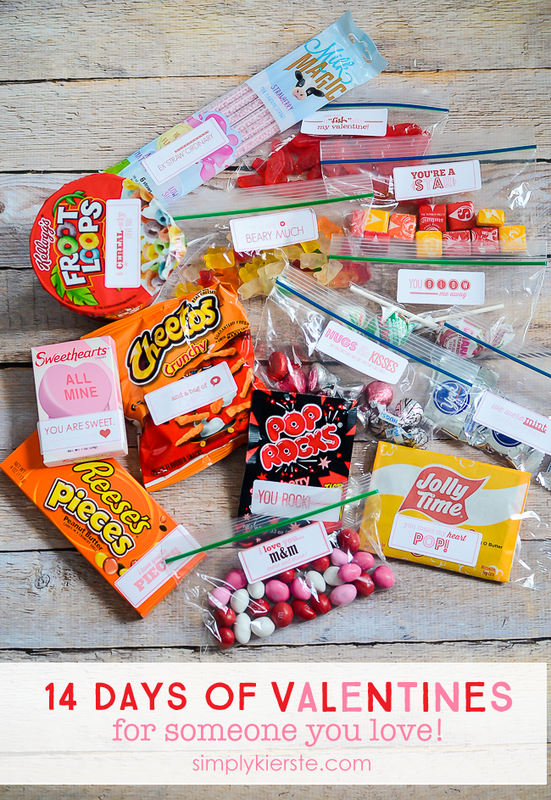 I love these popcorn labels and wanted to use them for my son’s class this year. However, I’m a little baffled by the printing “process”. If I print out the attached pdf on labels, I’ll get an entire sheet of the various labels, correct? I’m hoping to just have an entire sheet of one particular label. I’ve created a new labels sheet in WORD but I’m not sure how to “attach” the pdf so I can print off a page of just the popcorn label. Does that make sense? Do you have a moment to email me some instructions? Thank you! Thank you so much for making and sharing this! I loved doing this for my crew. However after I finished on Valentine’s day I have received some sweet surprises. :). I printed two pages of labels for my three loves. This left an extra set of labels. My daughter found them and has been surprising me with treats here and there. ❤️❤️❤️ I never expected that! I love this and would like to share with my readers in a Valentine’s round up! If that is a problem let me know. Otherwise, thank you!!! This is a great idea, and we are doing it for our son and his mission companion in the Tokyo South mission. I printed out the labels onto the Avery labels but they came out just a little below the labels and cut some of them off. Is there a way to fix this? Hi Kierste! Thanks for sharing! I love all of your cute ideas and love your farmhouse! I am having the same issue- some of them are printing too low or high on the label and cutting some of the words off. I am using the correct Avery labels and I tried the new pdf you linked with no luck. I’ll just use the cut off ones for my two year old (he can’t read anyway!) and use the centered ones for my husband. Just wanted to let you know! Thanks again- such a cute idea! I just printed these cute labels. Make sure your printer settings are set to “actual size” and not to “fit”. They should print correctly. Thanks, Kierste for a fun Valentine’s idea!